On LEAF Open Farm Sunday hundreds of farmers across the country will open their gates to welcome the public and showcase all that British agriculture delivers. LEAF Open Farm Sunday is The Great British Farm Day. It offers a unique chance to see what happens beyond the farm gate and show your support for British farming. This is your opportunity to talk to farmers and find the answers to the questions you’ve always wanted to ask… and even some you’ve never thought of! As well as producing nutritious food, farmers also grow crops for medicines and clothes. Crops can also be used for fuel and building homes. Farmers care for over 70% of our countryside. They also manage vital resources like water and soil, maintain miles of footpaths and hedgerows and provide homes for wildlife. 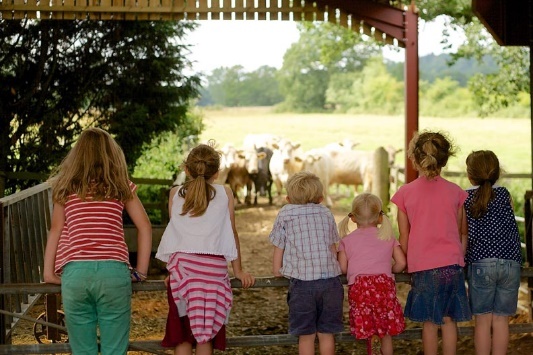 Most Open Farm Sunday events are free and farms of every type and size take part offering a range of activities. In fact, there is something for everyone to enjoy with loads to see, do and learn. On LEAF Open Farm Sunday you can learn more about how your food is produced, as well as discovering why worms are so important for the soil, why there wouldn’t be much fruit and veg without bees, and how farmers look after animals like cows, sheep and pigs, and care for wildlife too. You can also see science in action, including how farmers use the latest technology to farm sustainably. Maybe take a peek inside a state of the art tractor? On many farms, you will be able to take a farm walk or guided tractor and trailer ride, follow a nature trail and of course, talk to the people that make this all happen, the farmers! To find out more about LEAF Open Farm Sunday and which farms are opening near you on the 10th June visit www.farmsunday.org. LEAF Open Farm Sunday is managed by LEAF (Linking Environment And Farming), the leading organisation delivering more sustainable food and farming.